MK Danny Danon says Arab MKs who visited a hunger striking Islamic Jihad leader are the Hamas politburo in Israel's halls of power. MK Danny Danon (Likud) initiated the Knesset debate on Arab Knesset members who elected to visit hunger-striking Islamic Jihad leader Khader Adnan in the hospital. Adnan has entered day 65 of a hunger strike protesting the decision of a military court to detain him on the grounds the terror leader poses an immediate security risk to Israeli civilians. 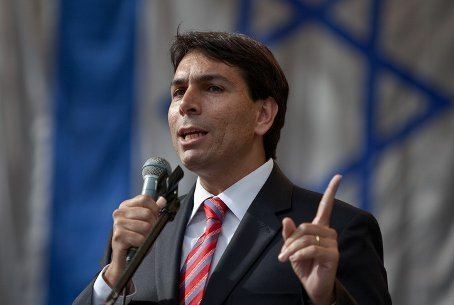 "The Arab MKs are invited to join the terrorists in his hunger strike, but doing so will not deter the state of Israel from doing what is necessary to defend its citizens," Danon said. Danon initiated the discussion after three Arab Knesset members visited Khader and then openly denounced Israel to reporters, late last week. "These Arab MKs have crossed all red lines, and now they decide to show solidarity with a terrorist and condemn Israel," Danon said. "Tibi praises terror 'martyrs,' Zoabi was on the Marmara and in photographs hobnobbing released terrorists," Danon said. "She blesses and celebrates with senior Hamas officials." "There is no doubt this is a continuation of the treacherous provocation of Arab Knesset members who use their seats to serve as terrorist auxiliaries,” he went on. "They are the politburo of Hamas in the Israeli Knesset." Adnan's ongoing hunger strike has become a cause célèbre for anti-Israel activists and Arab propaganda organs. His attorney appealed his administrative detention order to Israel's Supreme Court, which has agreed to hear the case. However, observers say the Supreme Court may not consider Adnan's hunger strike – unique only in duration – material to his detention as he is refusing food of his own volition. Previous hunger strikes have not resulted in prisoner's being released. The World Medical Association maintains hunger-striking prisoners who have made a rational decision to refuse sustenance should not be force fed. Israeli officials say they will consider forcibly terminating Adnan's hunger-strike should he begin to suffer serious health effects, but say that hasn't happened yet. Under Israel's administrative detention laws security officials may seek a court order to detain an individual without charge if they are suspected of being a threat to national security. Such orders can be appealed to a higher court, and must be reviewed by the court every six months. Israel's Supreme Court is the final court of appeal. Israeli officials have a strict policy of not discussing intelligence matters in public and Adnan's hearings have been held in closed court. However, Adnan is a senior member of the Islamic Jihad terror organization in northern Samaria. Islamic Jihad seeks the destruction of Israel and actively targets Jewish civilians. In late January, the GSS and Israel Police foiled a shooting attack planned by an Israeli Arab in collaboration with an Islamic Jihad terror cell from Tulkarem in northern Samaria. Last August, Islamic Jihad terrorists from Gaza were involved in the deadly cross-border ambush of an Israeli civilian bus that left 8 Israelis – 7 of them civilians – dead. Islamic Jihad leaders in Gaza – whose terror cells are heavily involved in rocket attacks on Israel's southern communities – have been targeted with airstrikes rather than arrest and detention. Fatah and Hamas officials have warned that Adnan's death in custody would spark mass protests throughout PA enclaves in Judea and Samaria, and Gaza.